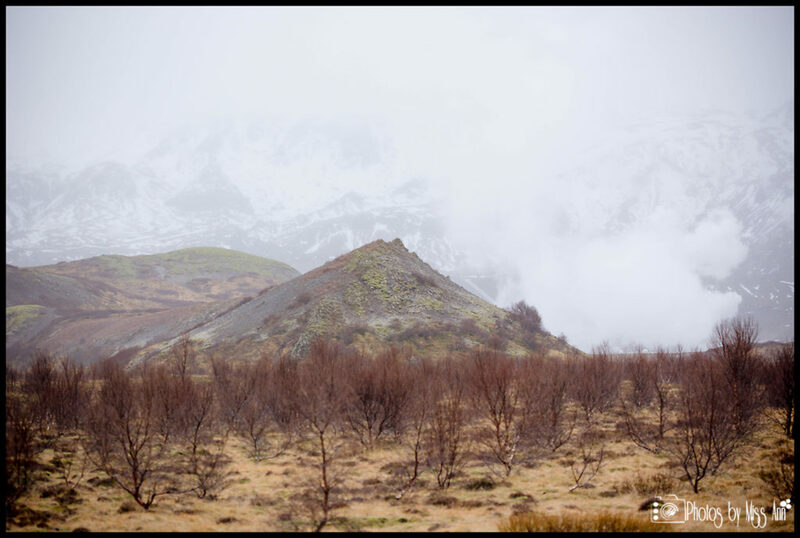 Finding the right wedding venue for your Iceland destination wedding is one of the most important early steps in wedding planning. Objectives may include finding a hotel in a secluded setting, accommodating hard to please guests, close to the attractions you want to see, and offers a personal romantic experience. Good news! 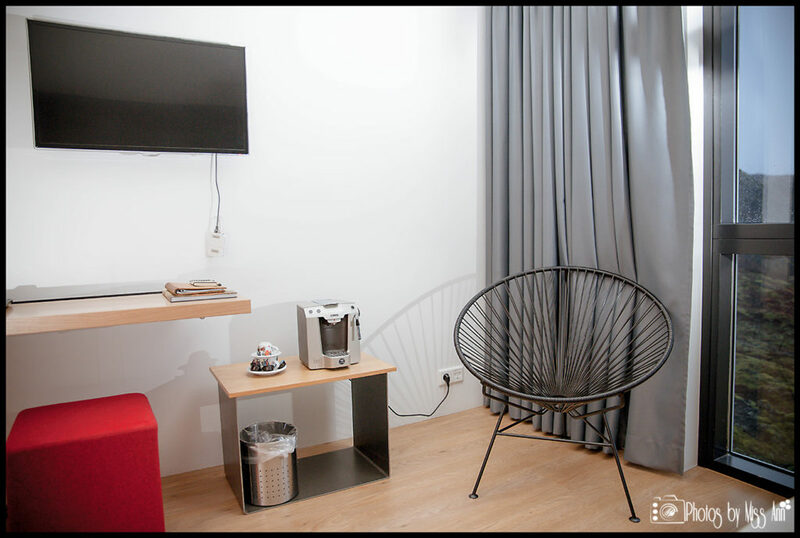 The ION Luxury Adventure Hotel includes every one of those features and so much more. 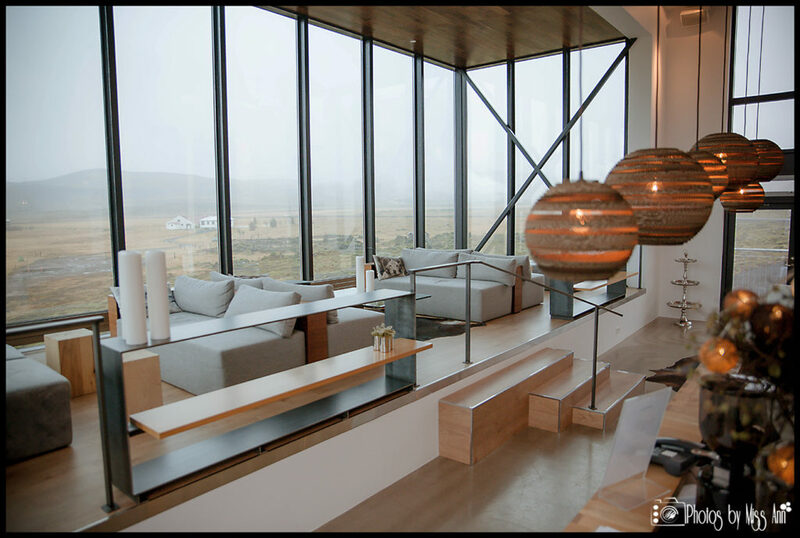 There are very few hotels in Iceland that have such a dramatic setting while having a Michelin Star Chef at the restaurant helm. 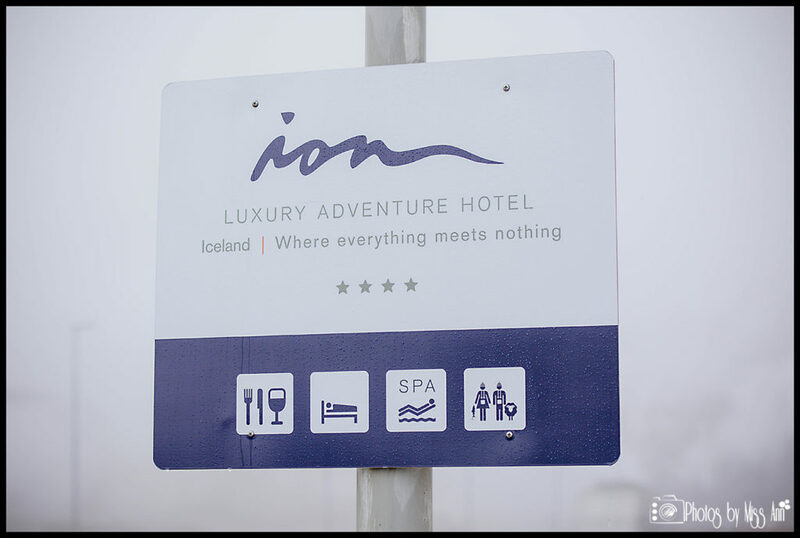 The ION made our 2013 Favorite Iceland Wedding Hotels list because of the complete experience they offer. When you plan a trip to the land of fire and ice, you are in search of a place that encompasses that tagline, right? 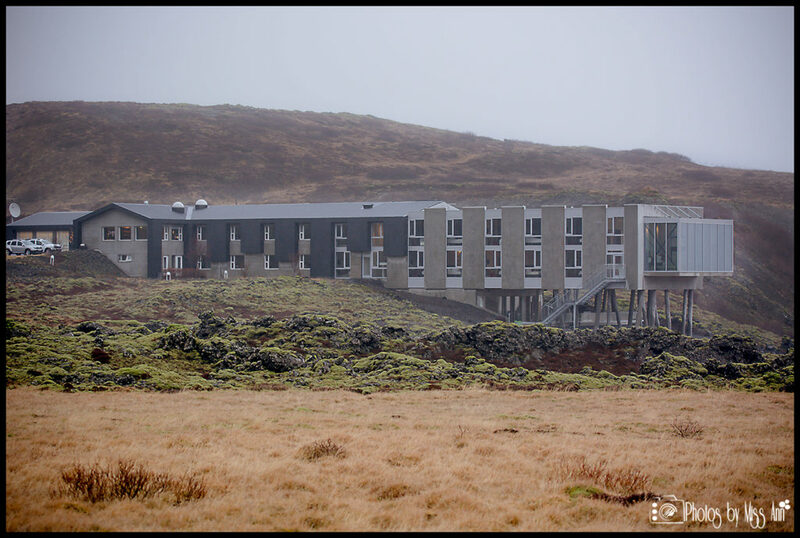 The ION Luxury Adventure Hotel’s location takes full advantage of the hotel’s natural backdrop of Mount Hengill’s lava fields and the majestic Thingvellir Lake. The ION brings the dramatic Icelandic elements of fire and ice together and connects you to them. 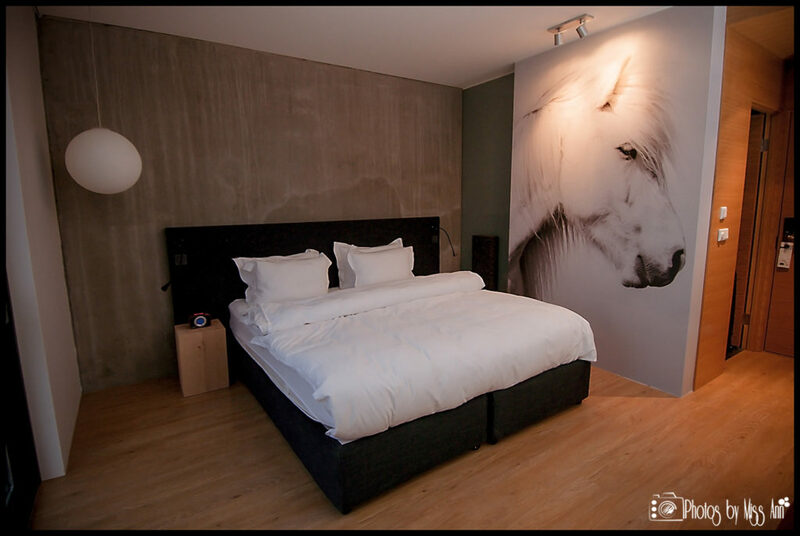 Hotel ION provides guests with an unforgettable 5 senses experience. 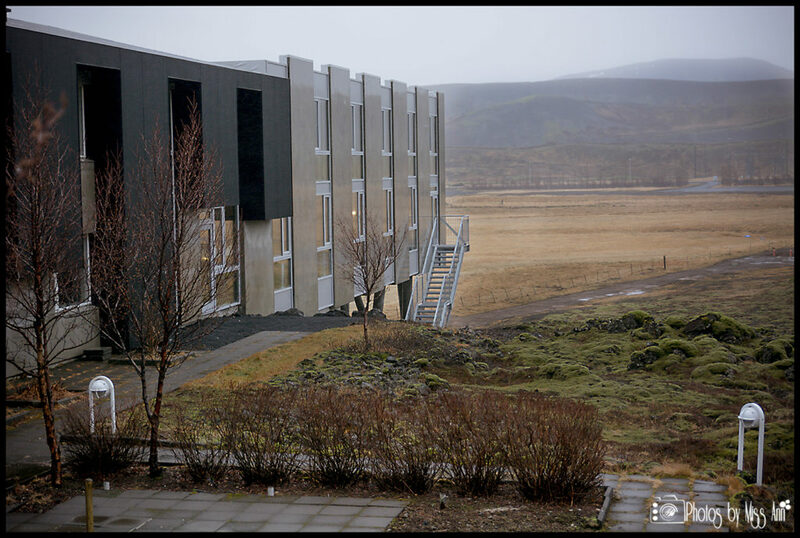 Your eyes will delight in the distinctive design of the hotel, your ears will appreciate the stillness of the natural surroundings, your touch will be encircled by the warm waters of their magnificent geothermal spa pool, you will smell the pure Icelandic air, and your taste buds will be overwhelmed by the delectable meals the Silfra Restaurant creates! I’ll be honest and say that we had set some pretty high hopes for our stay at the ION Luxury Adventure Hotel and they exceeded our expectations at every turn! 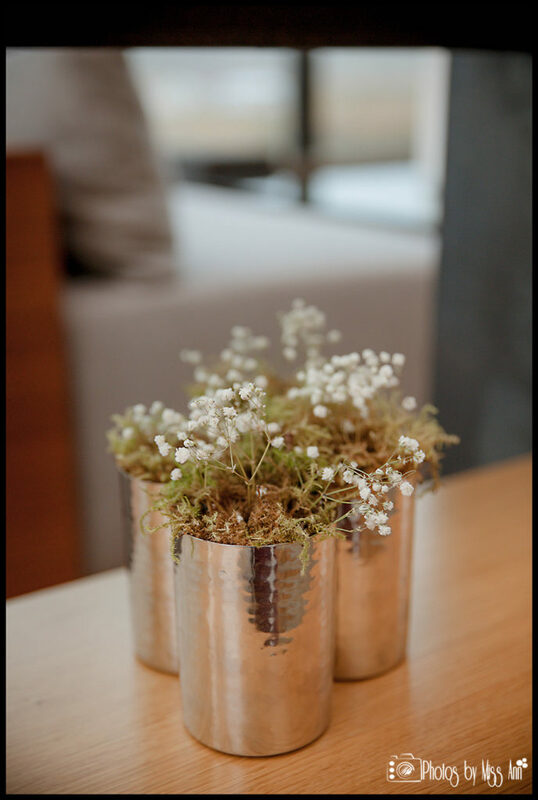 We highly recommend this fantastic hotel to any couple out there in search of an idyllic Iceland wedding location no matter the season you plan to marry. 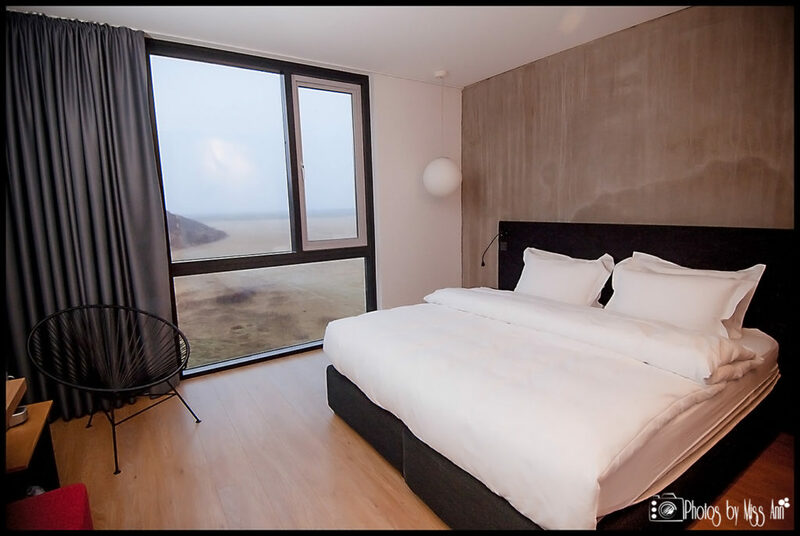 The ION Hotel in Selfoss opened their doors in February 2013 and currently has 45 total rooms to offer Iceland wedding guests, groups, and Iceland honeymooners. 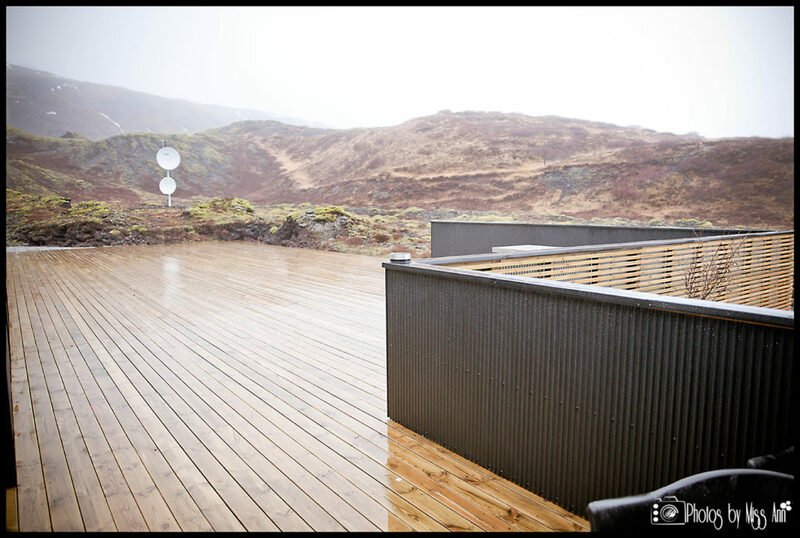 They have deluxe and standard rooms to choose from, all offering a phenomenal view of either the extraordinary lava fields and Thingvellir Lake or the steaming Nesjavellir Geothermal Power Station. 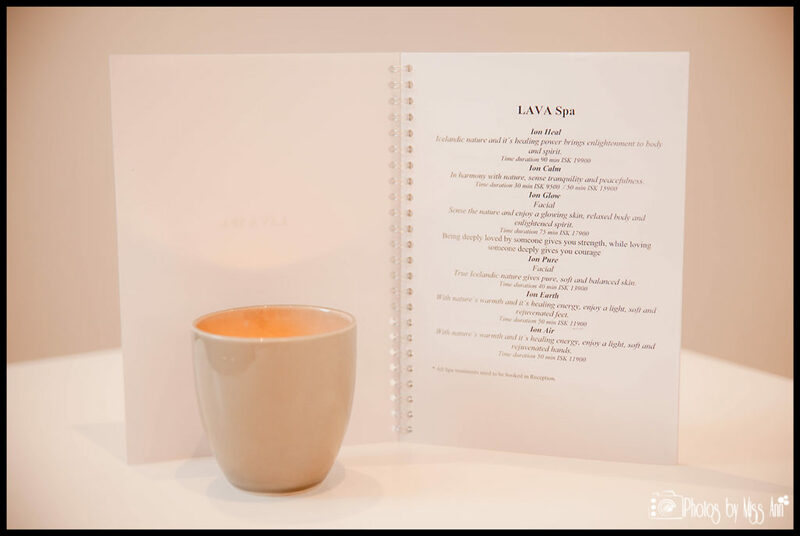 The famed Silfra Restaurant, Lava Spa, and Northern Lights Bar are all located inside ION, so make sure you take the time to check them out! The starting price of a night’s stay at this superb hotel begins at 32,000 ISK (~$275 USD). 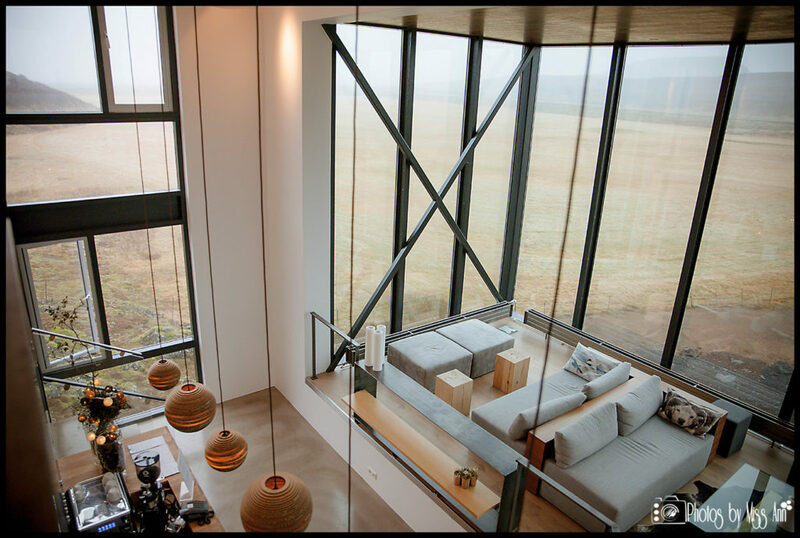 It was a rainy December afternoon as we made the drive from Frost and Fire in Hveragerdi to the ION Luxury Adventure Hotel in Selfoss. But it was still an inspiring drive beside the mountains. 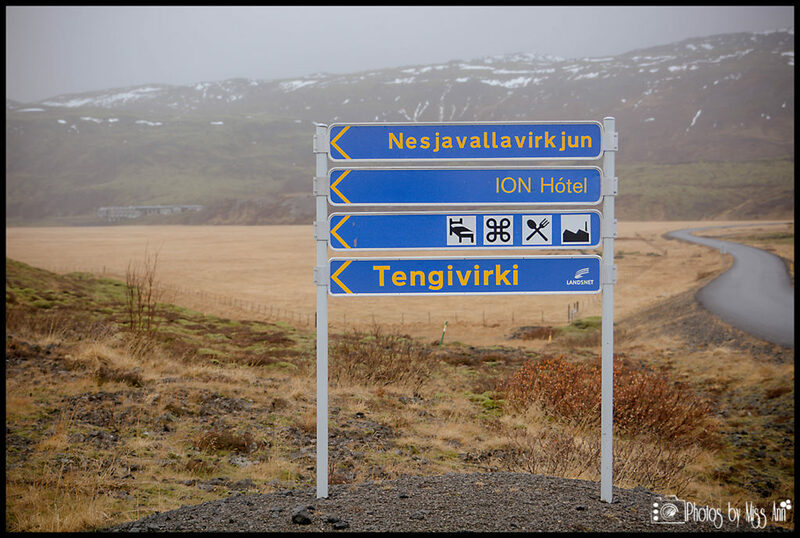 From the moment we left downtown Selfoss we saw signs leading us all the way to ION. The scenery you pass is filled with picturesque mountains, rustic farm animals, incredible lake views, and moss covered lava fields. At every turn we were anxiously anticipating our arrival. 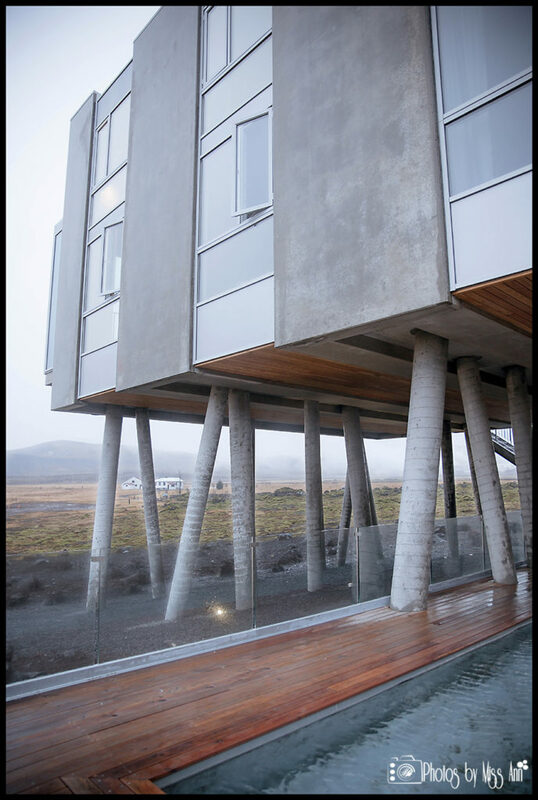 Then there it was… a very chic modernly designed hotel set within moss covered lava fields, cushioned between a volcano, geothermal grounds, and a lake! Our enthusiasm was off the charts! ION was stunning and every bit as beautiful as all of the photos on their website suggest. Sadly, it was raining during our visit; otherwise we would have had more vibrant exterior shots to share. Walking into the front door of the ION Luxury Adventure Hotel, the staff members greet you with welcoming faces. 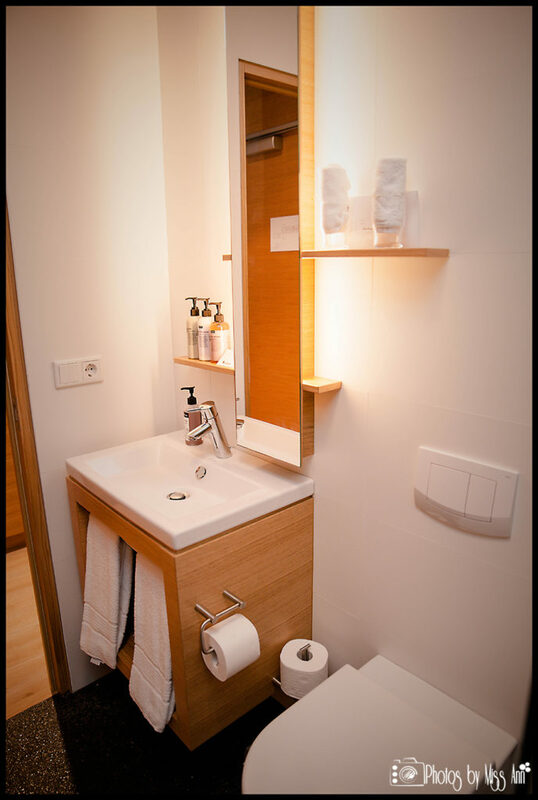 We felt that everyone on the ION team throughout our stay were professional, accommodating, and knowledgeable. Once we checked in, we had a tour of the ION Luxury Adventure Hotel. 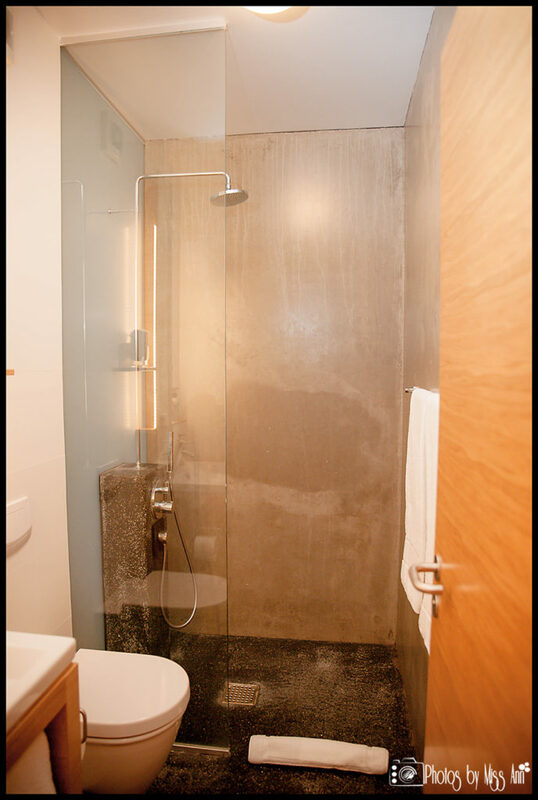 The hotel design has immersed itself in natural tones. 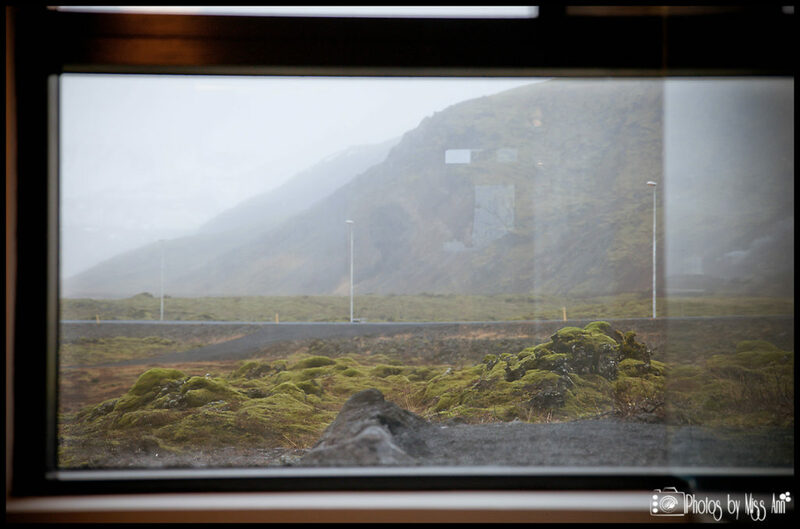 Even when we were inside, we felt completely connected with the Icelandic landscape. 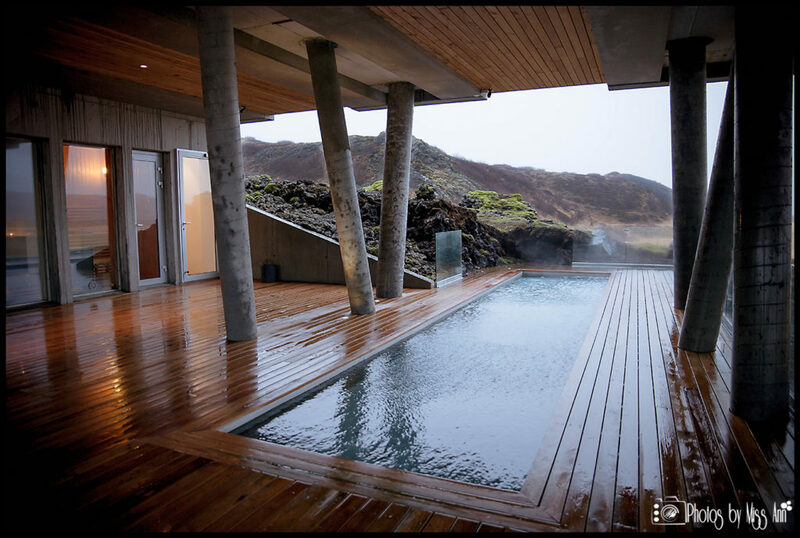 There was one extraordinary detail that surprised us… As you step down the staircase to the Lava Spa, there are full length windows that allow you to be submerged in the lava fields eye to eye but still sheltered from the elements. 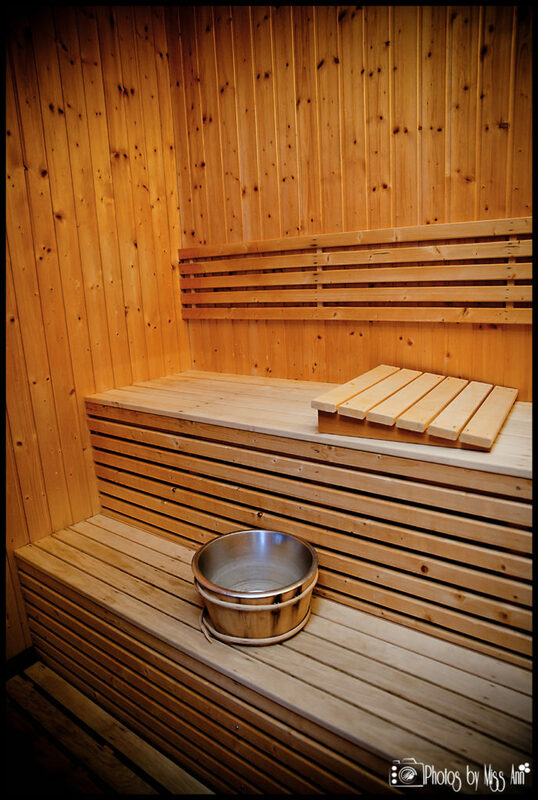 As you continue down the stairs, to the right you will find the entrance to the Lava Spa. 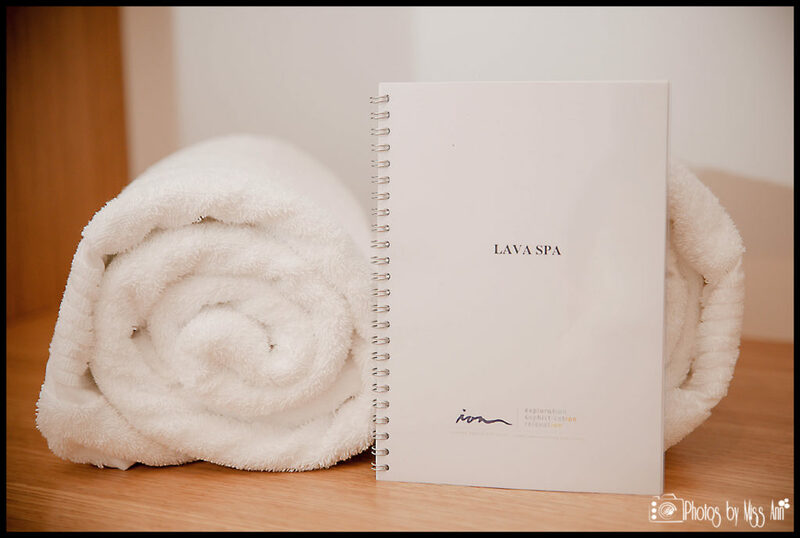 If you appreciate ultimate relaxation and spoiling, the Lava Spa offers numerous services for you to partake in. 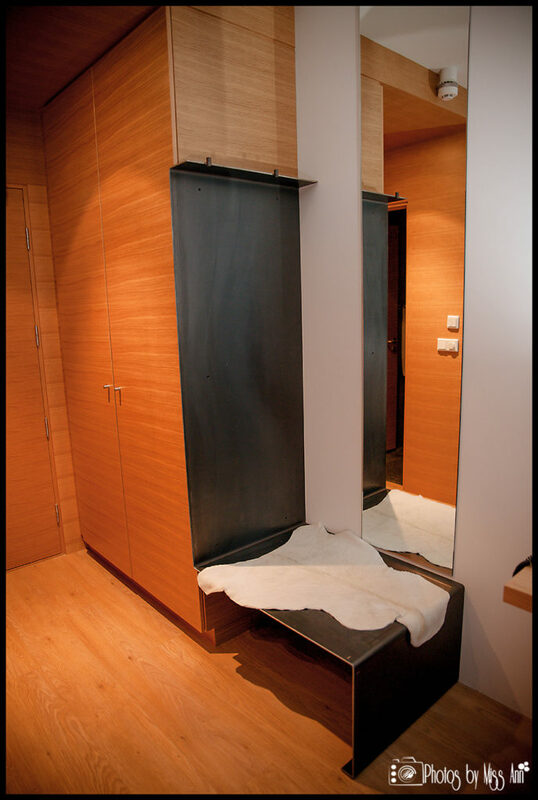 There is also a meditation room where guests are welcomed to unwind at any time. 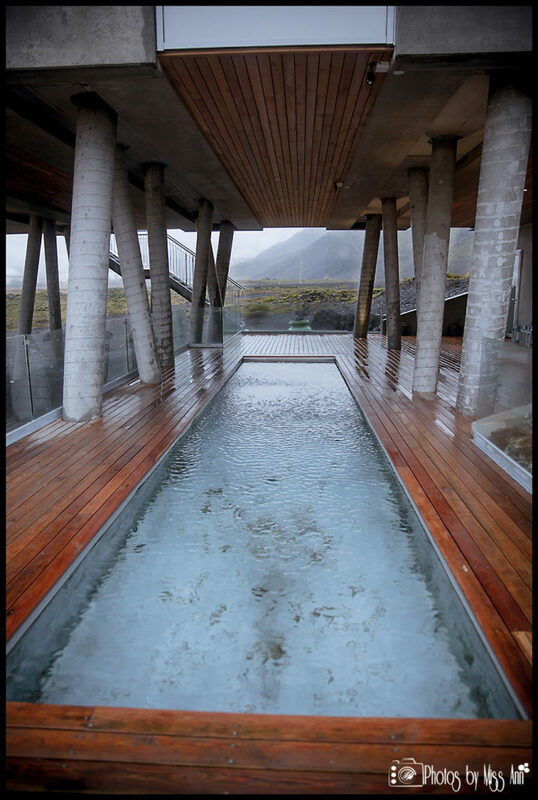 A brilliantly designed spa pool just outside of the Lava Spa allows you to experience the Icelandic elements without actually leaving. The hotel even offers champagne service poolside for anyone celebrating. 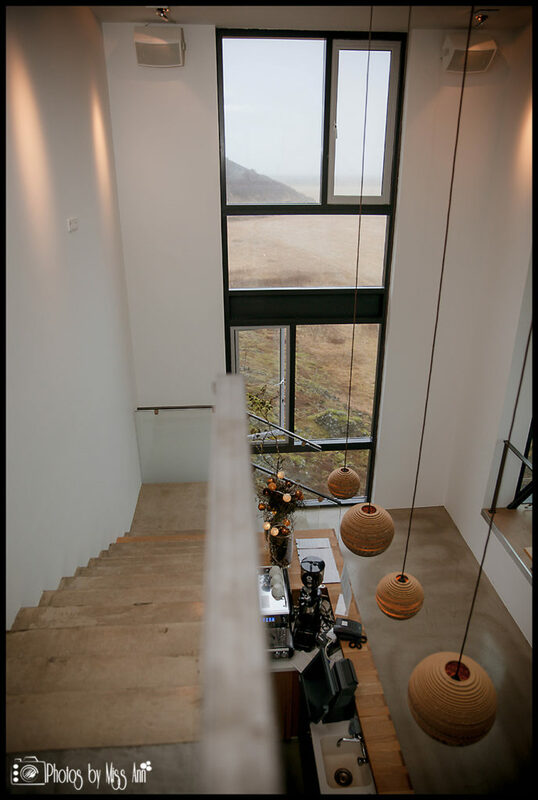 As you step down the staircase into the Northern Lights Bar, there are full length windows that allow you to be engrossed in the lava fields while still staying warm and cozy. 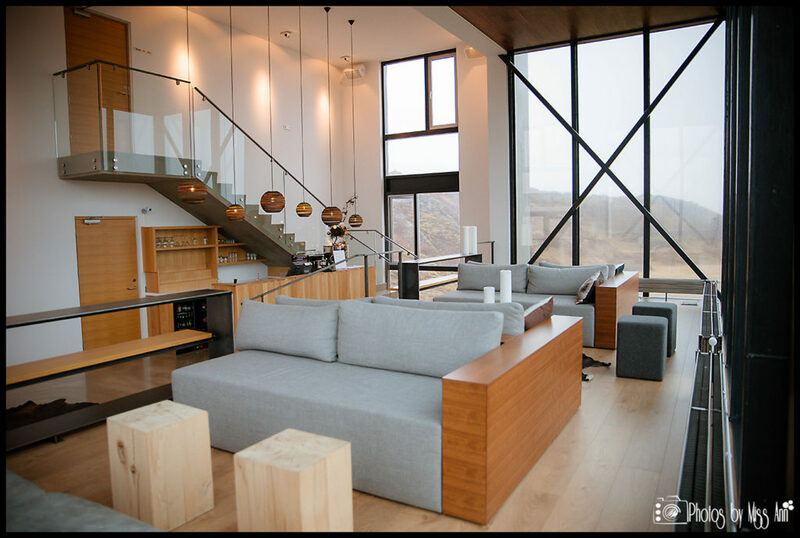 This feature makes the ION Luxury Adventure Hotel a prime spot for Northern Lights viewing. Many I’m sure have spent the evening there with a cocktail in hand relaxing under the Northern Lights, the stars, or midnight sun. 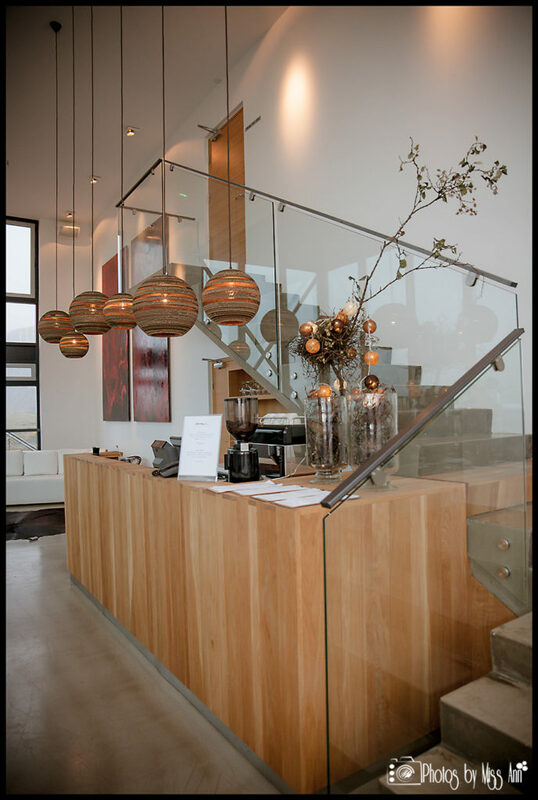 If you are planning an Iceland elopement then the ION’s Northern Lights Bar could also dual as your inside ceremony location if needed as well. 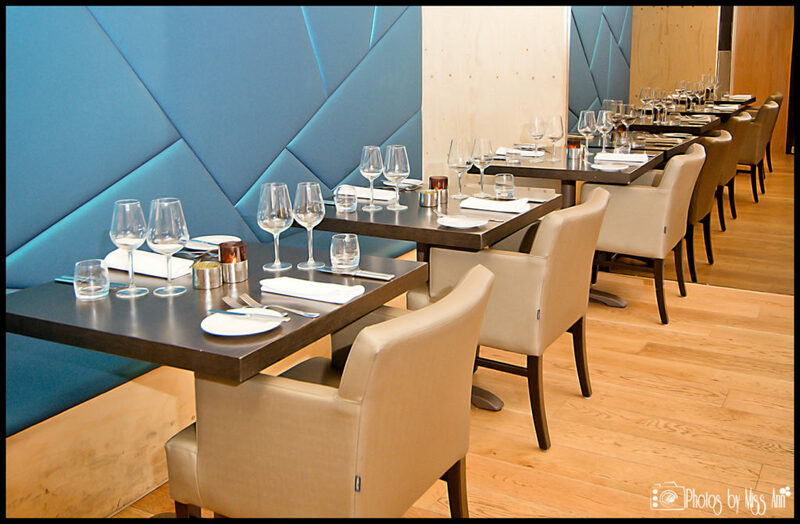 Artistic elements throughout the bar are also ecologically sustainable. 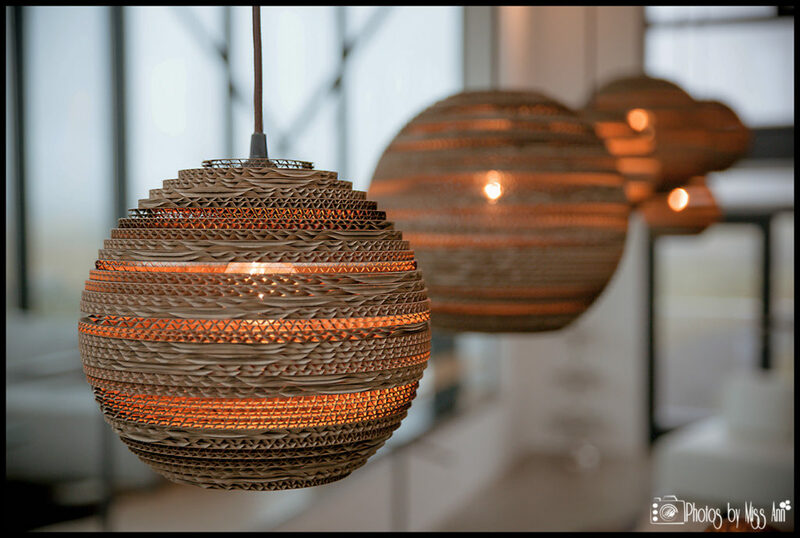 For example, salvaged driftwood was transformed into many of the wooded details throughout the hotel and even the lights over the bar are astonishingly fashioned from recycled cardboard. 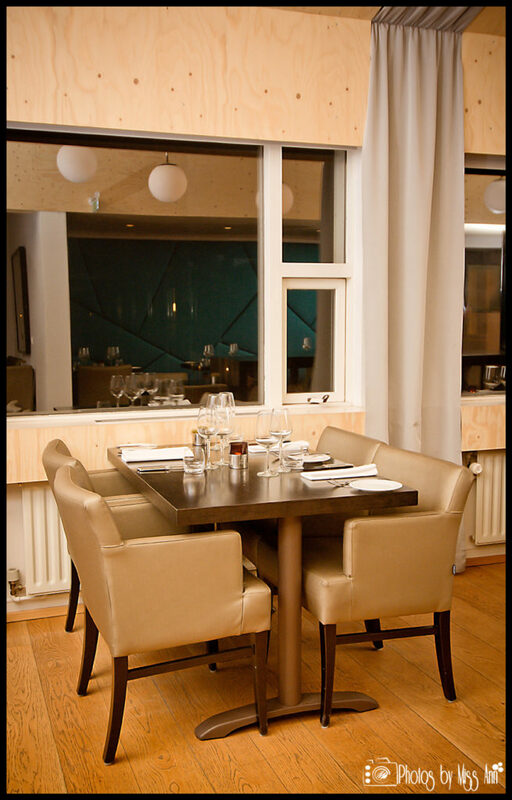 The ION’s Silfra Restaurant is stylish, inviting, and offers plenty of seating for guests to dine. If holding a wedding at ION Luxury Adventure Hotel, there are two other sections outside of the main dining area that can accommodate larger groups for a more private experience. First there is a meeting room that can easily hold 50 people. 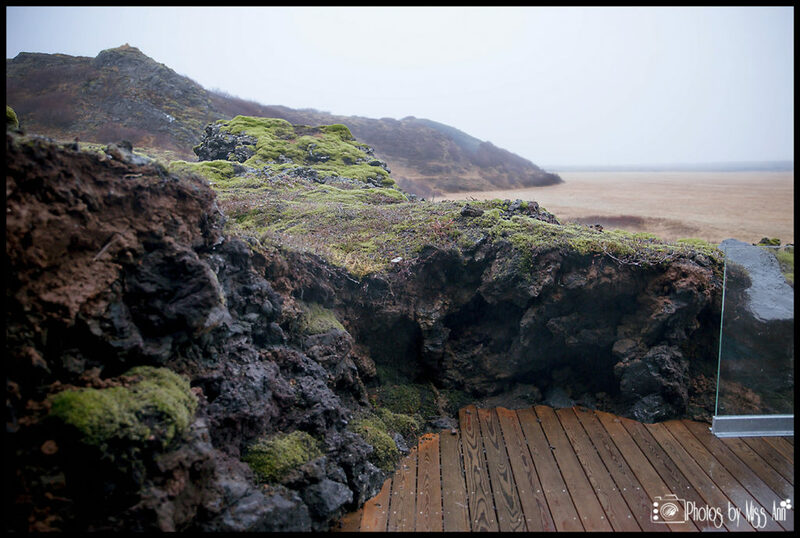 Also, just outside of Silfra lies a spacious patio allowing you to sit amongst the lava field. For larger Iceland destination weddings at the ION, they have even put a pole tent over the patio to house more than 100 guests. Weather permitting you could also easily have your Iceland wedding reception cocktail hour out there. 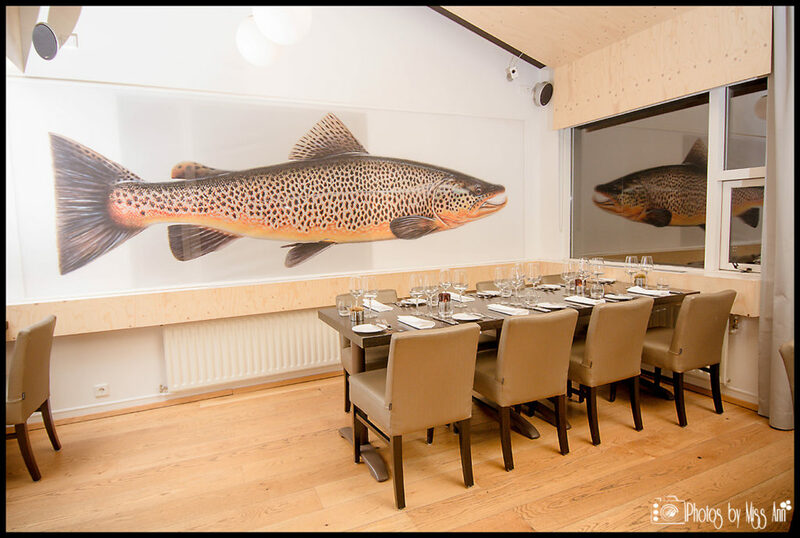 Our dinner dining experience at ION’s Silfra Restaurant was first class from start to finish. 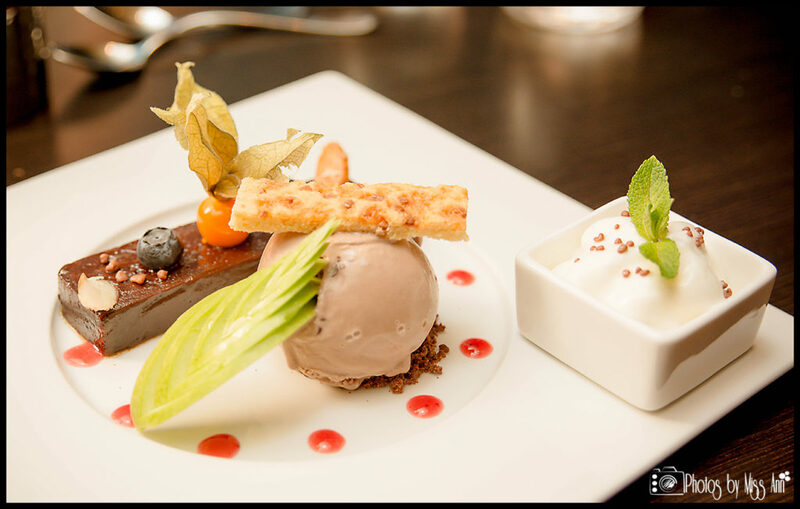 The acclaimed Michelin Star Chef Gudmundur Sverrisson has created a remarkable menu full of traditional Icelandic treats. Chris and I had a bottle of champagne and each opted to each try 3 different courses that evening. 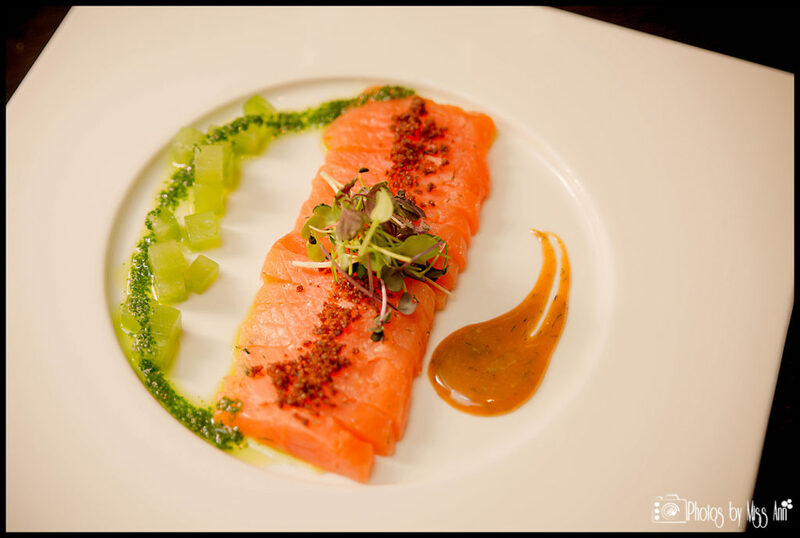 Chris chose the famed Arctic Char which was cured, served with pickled cucumber, alongside of a delightful dill sauce. This dish was served cold and we found every bite to be a refreshing mix. 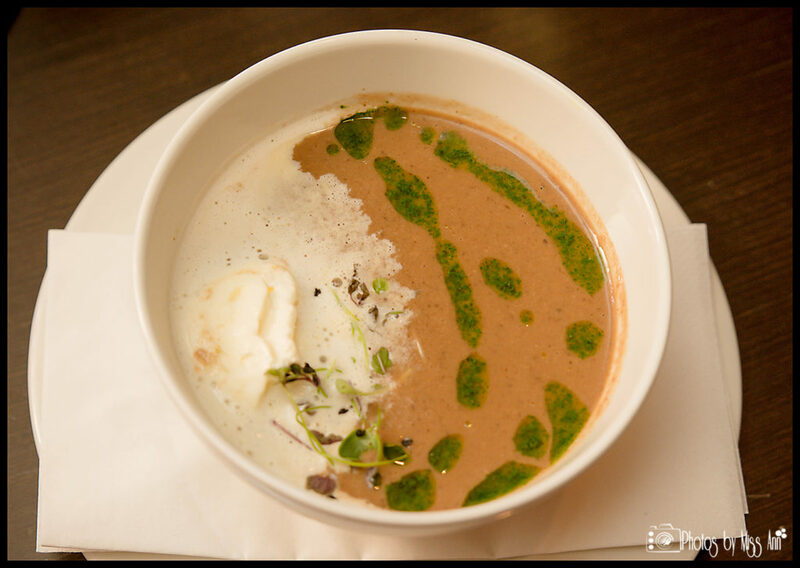 I personally could not resist ordering the Mushroom Soup and it was hands down one of the best I have had. It was creamy, full of flavor and had me vying for the recipe by the end of the bowl. 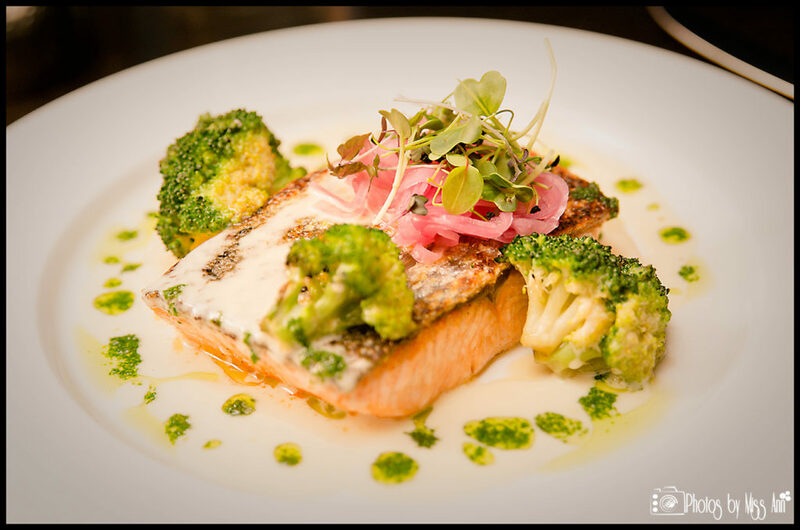 For the main course Chris chose the fresh caught Pan Fried Salmon. The plate was perfectly presented with parsnip puree, fried broccoli, in a white wine sauce, all of which brought an overall amazing taste and color to the dish. 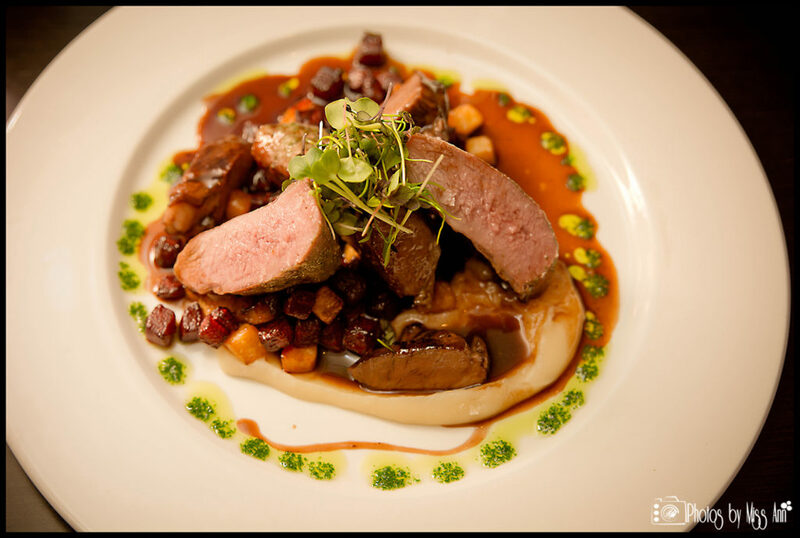 I chose the utmost wonderful Filet of Lamb, served with root vegetables, parsnip, pork cheek, and a red wine sauce. You think all that is divine? …Oh wait! It gets better! 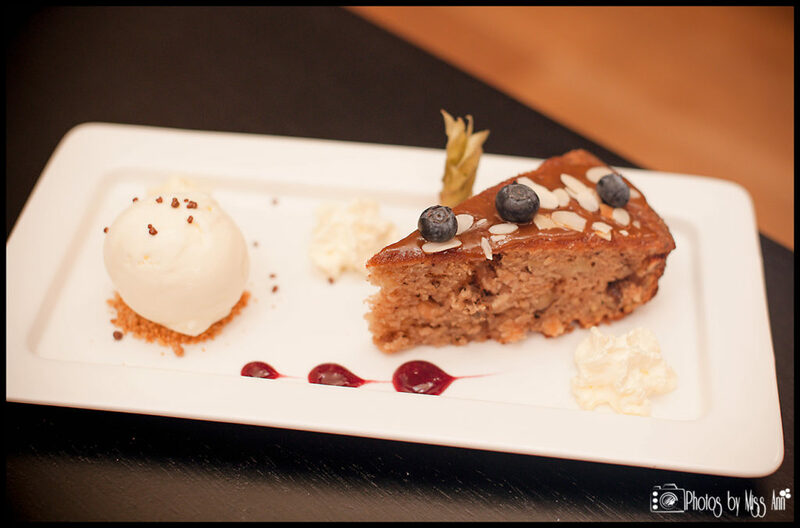 The hand crafted dessert options at the ION’s Silfra Restaurant will make you smile from ear to ear! 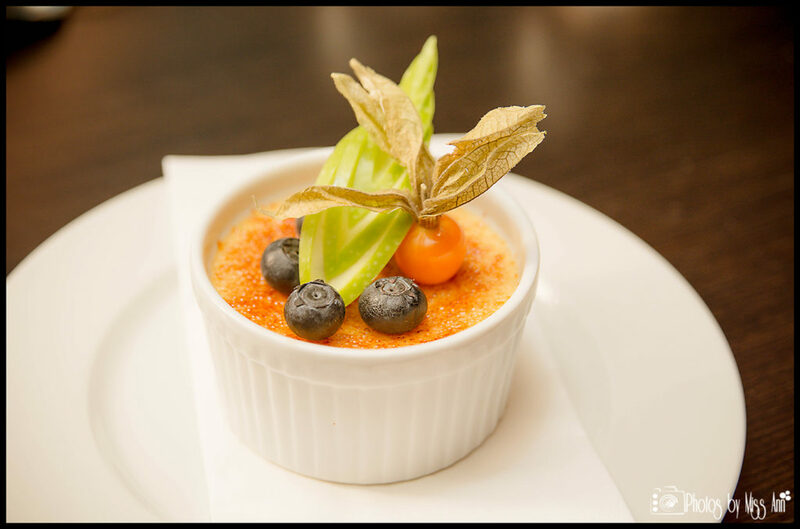 The Skyr Crème Brûlée was Chris’s choice, and he even boasted about it being the best he had ever had. I went right for chocolate bliss and ordered the Triple Chocolate Delight which was a luxurious combination of cake, mouse, and chocolate ice cream. The presentation of each course was tops all the way and the taste of all of the flavors coming together in each bite was monumental. 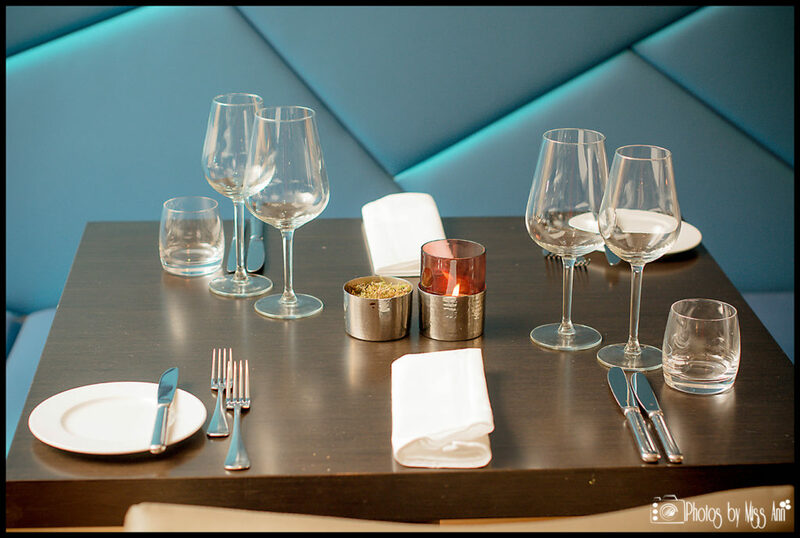 The fine flavor combinations within each course are sure to please even the biggest foodie. 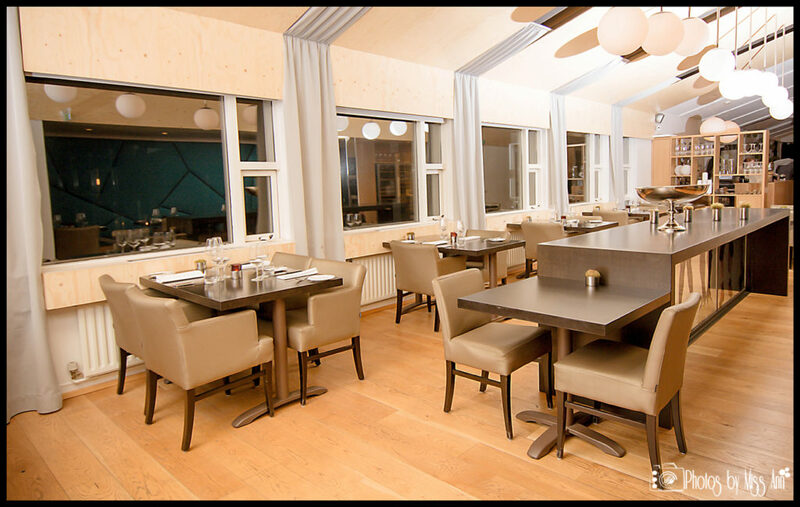 We believe the ION Luxury Adventure Hotel’s Silfra Restaurant offers supreme quality, impeccable service, and would be a marvelous location to hold your Iceland wedding reception. After trying some Icelandic specialty cocktails we grabbed our posh robes from the room and headed down to the geothermal spa pool. To our delight we had huge snowflakes falling as we sat and relished in that amazing moment! The combination of cold winter air, warm water, and snow falling, all created a magical memory. 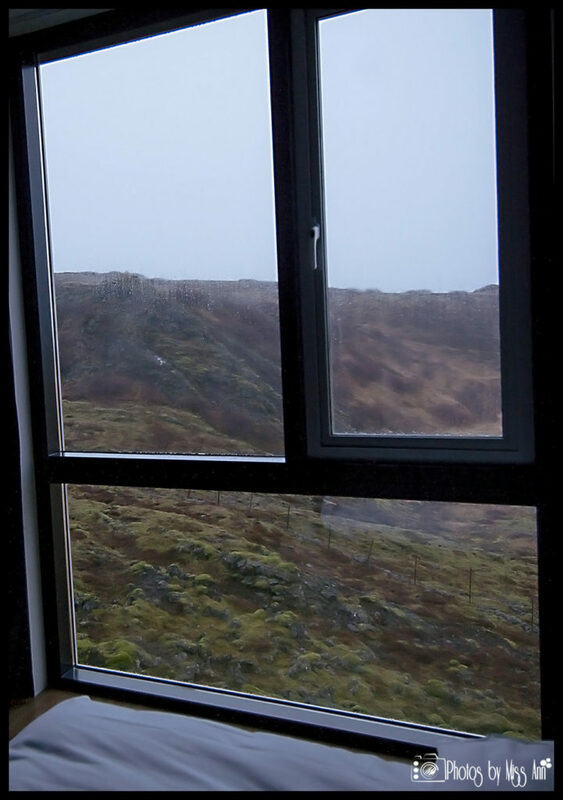 Our room that evening was #219 which boasted a view in the direction of the lake Thingvellir. 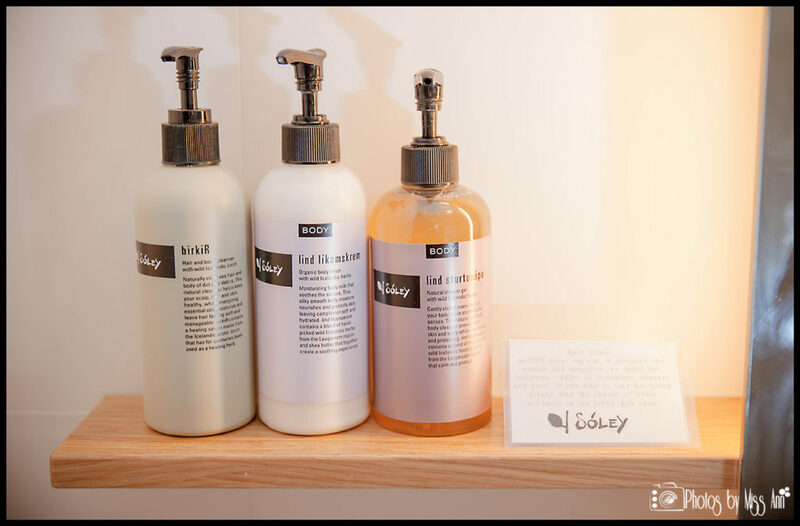 The entire room was outfitted with premium eco-friendly products from the bed to bath. 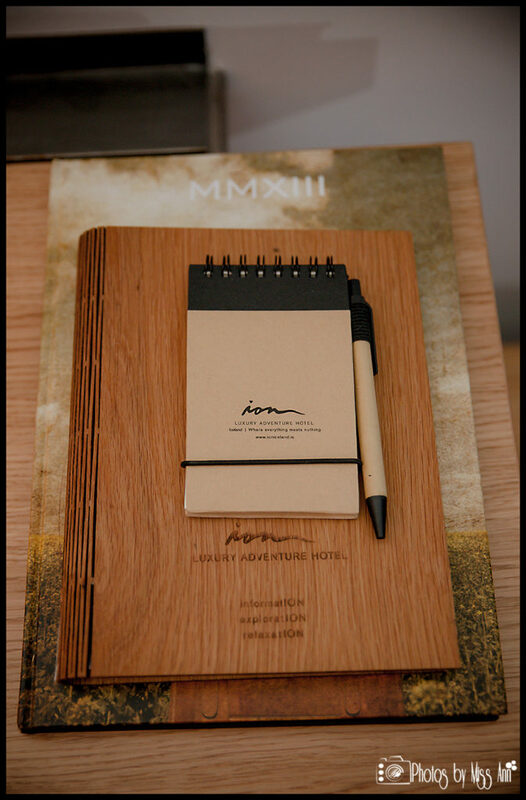 You have all of the classic and luxurious 5 star room amenities on hand. Although we were not graced by the Northern Lights during our stay at ION, we knew we wouldn’t miss them since they have a night staff member checking for them throughout the night. That person phones guests if they make an appearance. The next morning, we actually woke up to ice on our room window and about 3 inches of snow outside! 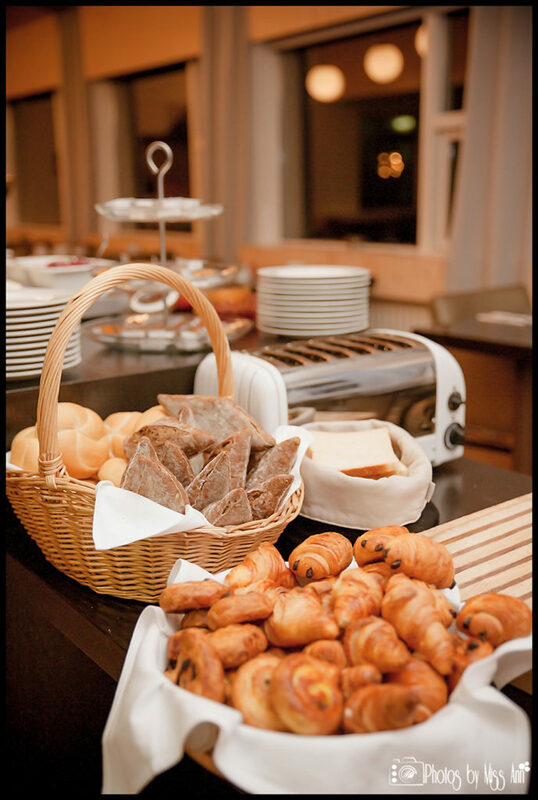 ION Luxury Adventure Hotel offers an exceptional breakfast selection to its guests. 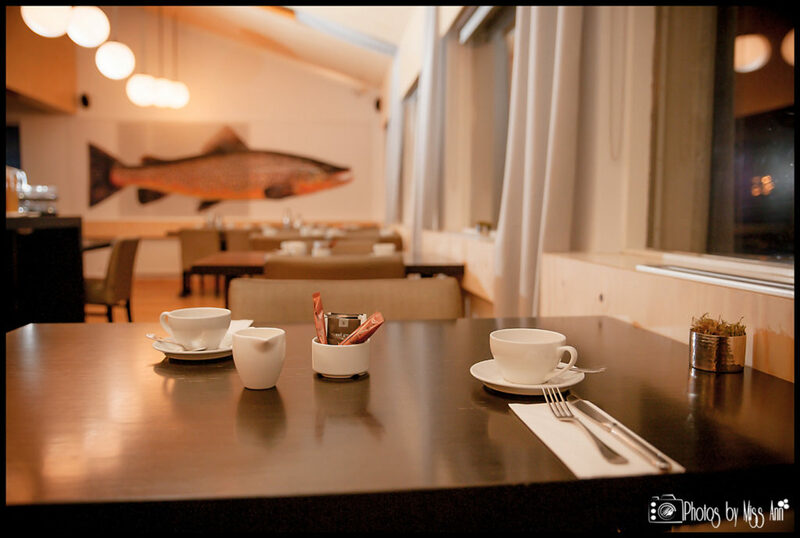 It is beautifully presented and available in the Silfra Restaurant beginning at 7am. 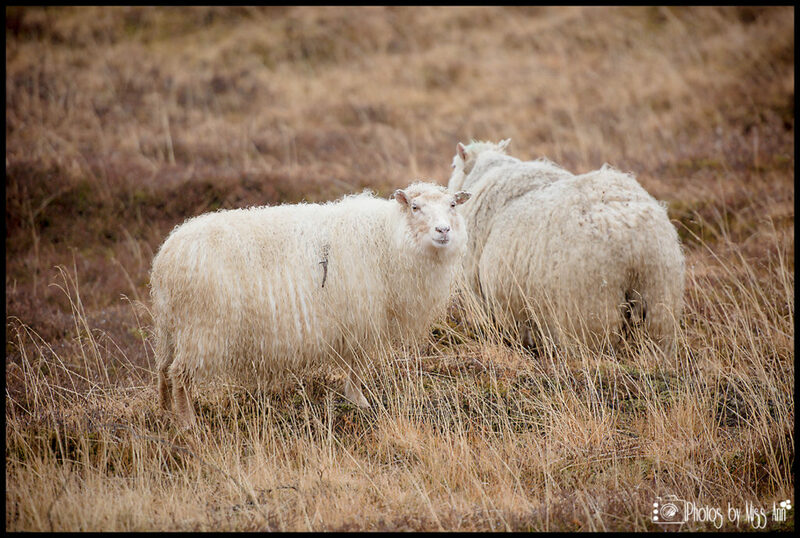 You can expect to have farm fresh eggs, warm bacon, cold meats, cheeses, breads, granola, Icelandic Skyr, fruits, and endless drink choices. Although, the sudden snow storm did spoil our original plan of taking the beautiful mountain pass road (Route #36) and going back into Reykjavík, instead we took the safer route back down through the Selfoss downtown. As a side note, there are several roads in Iceland that are closed during the winter months so be aware of them as you plan out your driving routes. 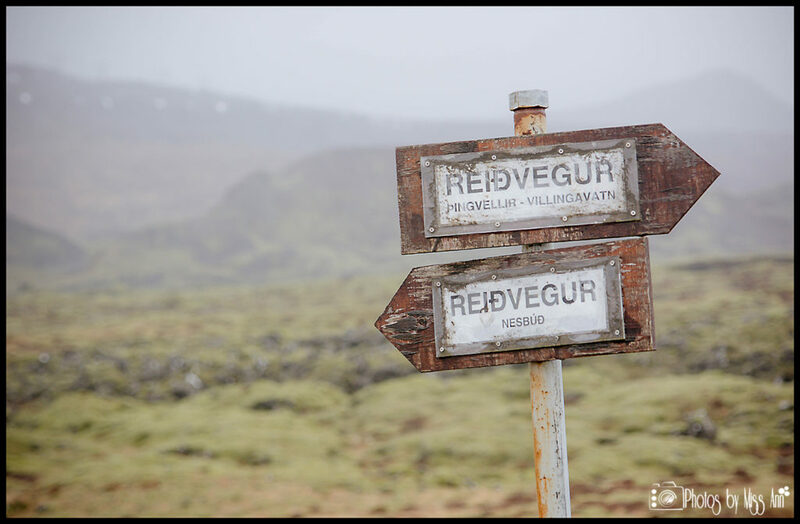 Specifically Iceland route #431 and #435 are closed from Oct 1st-May 1st. 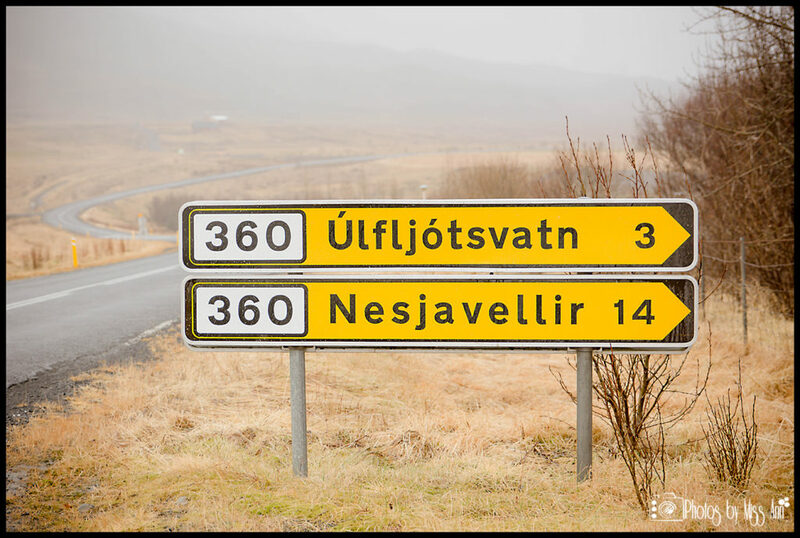 So when driving to the ION Hotel during winter months use Route #36 (Mosfellsbaer) and turn right onto #360 towards Nesjavellir or take Route 1 to Route #35 and #36 in from Selfoss. 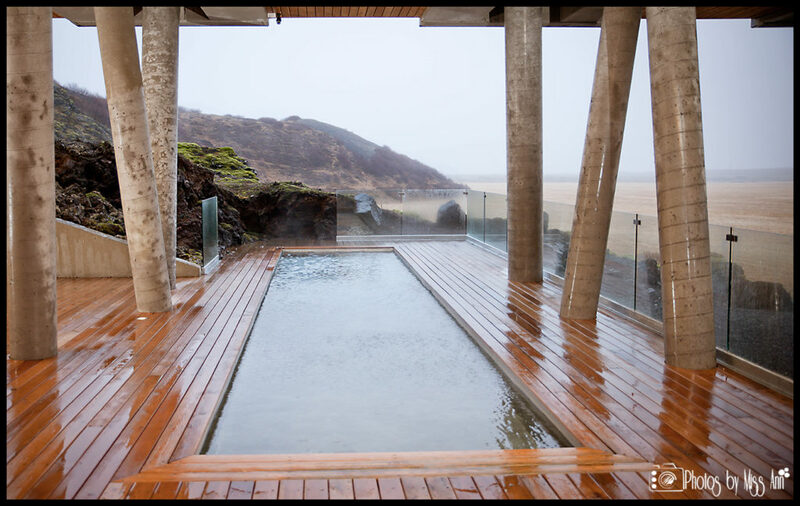 Iceland is filled with many extraordinary hotel options, but most times your Iceland wedding budget plays the deciding role on where you end up. 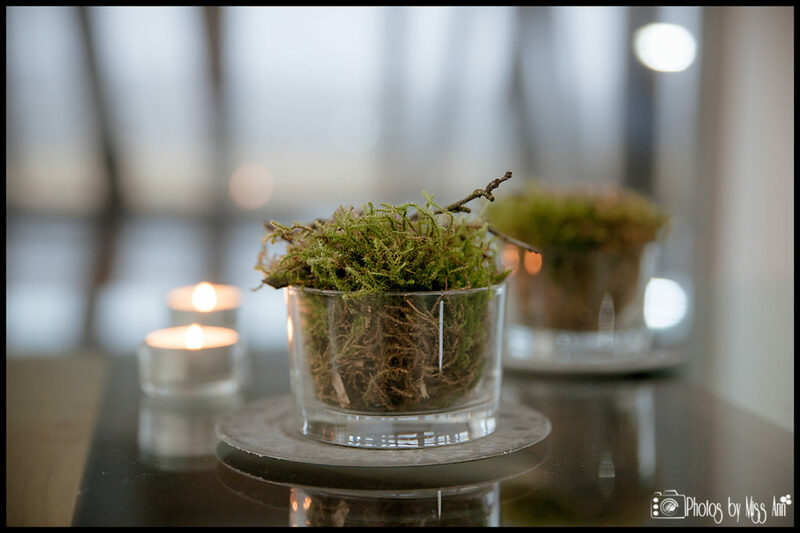 As Iceland wedding planners, part of our service to you is personalized venue appraisals and timeline planning to ensure you make the right choice for your wedding day in Iceland. Please feel free to contact us for more information on getting this process started for your big day! We would love to chat more with you about your Iceland dream wedding, possibly be your wedding planners and Iceland wedding photographers! 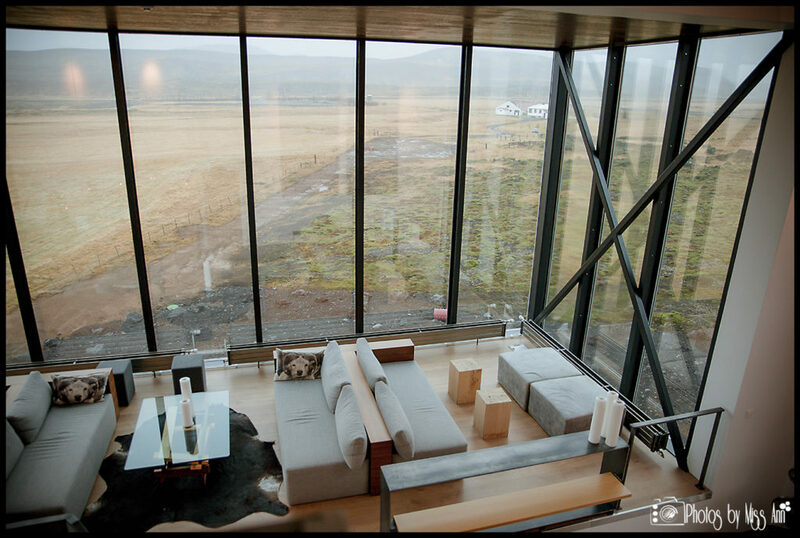 We hope you have enjoyed our Iceland wedding hotel 2013 favorites list over the past several weeks. 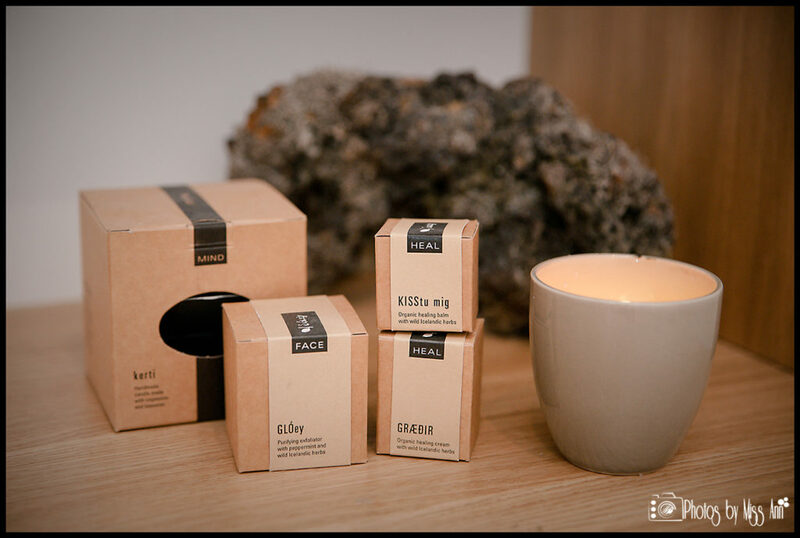 In case you missed our previous posts please feel free to go back and check them out: Hotel Laekur, Hali Country Hotel, Frost and Fire, and ION Luxury Adventure Hotel. 2002-2014, Photos by Miss Ann, All Rights Reserved.